Food for diabetic people is an area of debate because there are very fine dietary distinctions when it comes to sugar, fats, and snacking. And not all exercise is created equal. You will be surprised to know that anything from your sleep habits to the nail salon you visit, affects the management of your diabetes. 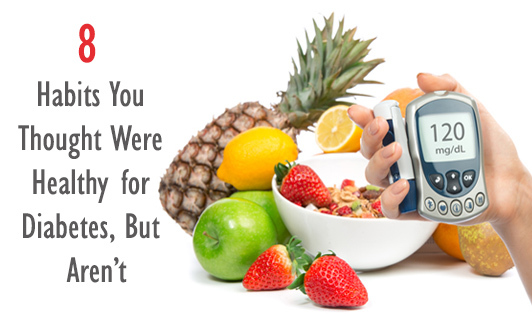 So, it’s important to become educated about how all your daily choices may affect your diabetes management plan. Read on to find out whether habits you thought were healthy may actually be sabotaging your diabetes control. Eating sugar-free foods: Sugar-free foods can still impact blood sugar because they may be loaded with sugar alcohols and other carbohydrates. Always count these carbs, plan an exercise regime and stick to a healthy diet for better results. Mixing all fat: Not all fats are the same, and not all are harmful. While you should limit saturated fats, and avoid trans fats, eating a diet rich in polyunsaturated fats, especially those containing alpha-linolenic acid (ALA), an omega-3 fatty acid, can be protective for the heart, reducing the risk of developing heart disease. Try adding ALA-rich foods including nuts, leafy vegetables, flaxseeds, and flaxseed oil. Skipping snacks: Eliminating snacks from your diet may help you trim calories, but cutting out all snacks isn't the answer — smart snacking is. If you're a frequent snacker, cut back to just one or two a day, and use these mini meals as a way to fill in nutrition gaps — extra veggies or dairy, for example. Overdoing exercise: Exercising too much can also lead to a rise in blood sugar levels over time because it triggers the release of glucose-raising hormones like adrenaline, according to the American Diabetes Association (ADA). Treat yourself to a day of active recovery with a relaxing, easy walk or some restorative yoga. Sleeping in on the weekend: Losing sleep, even one night, can affect blood sugar control, and make the body more insulin-resistant. Moreover, if you sleep for long hours during weekends, the blood sugar might dip drastically. Dropping weight fast: If you're overweight, dropping pounds is important for managing diabetes, but so is how you approach dieting. Watch portion sizes, plan ahead with nutritious foods for easy-to-assemble meals, eat lots of fruits and vegetables, exercise, and read labels. These are the types of behaviors to help you now, tomorrow, and all the years down the line. Getting pedicures: A pedicure can be relaxing, and taking care of your feet is important when living with diabetes. Stay away from the pedicure chair if you have an infection, ulcer, or cut on your foot. If you suffer any cut or opening in the skin during a pedicure, you're at risk for an infection. Eating unlimited fruit: If some fruit is good, lots must be better, right? While fruit is rich in nutrients and very good for you, it should be eaten in moderation. A diet high in soluble fiber can slow the absorption of sugar and control blood sugar levels. Many fruits are high in fiber, especially if the skin or pulp is eaten.